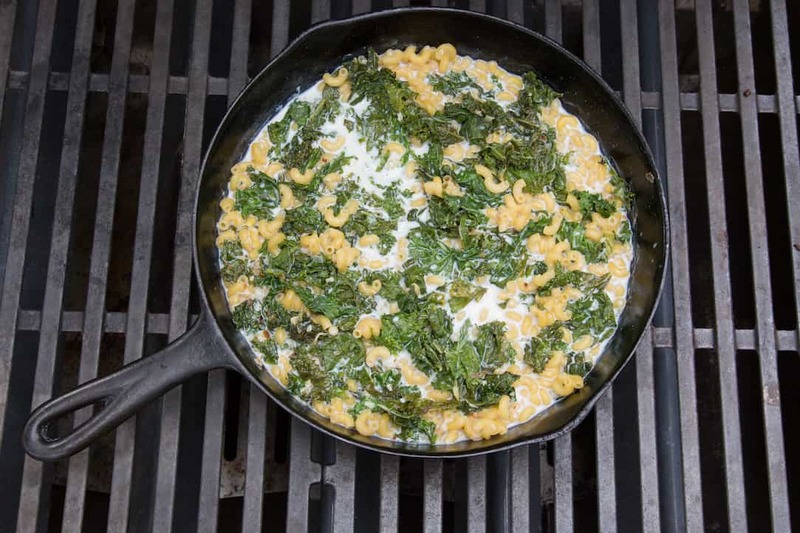 Grilled Skillet Mac and Cheese with Kale | Good. Food. Stories. 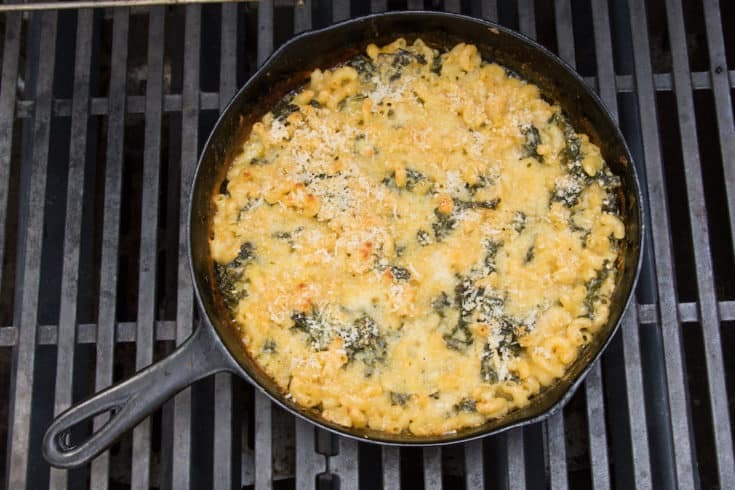 As noted in my post on how to cook almost anything on your grill instead in the oven or on the stove, one of my favorite summer comfort foods is grilled skillet mac and cheese mixed with copious amounts of fresh greens. Following is my recipe for grilled skillet mac and cheese, made in my beloved cast iron skillet. It’s really not that different than making skillet mac on your stove, but make sure to have all your ingredients measured and ready to use before you begin. Unlike inside the kitchen, where the fridge is only a few steps away, you don’t want your garlic to burn if you need to spend 5 minutes measuring the broth or milk. Note that I use a 3-burner gas grill for all of my recipe testing. If your grill is smaller, or if you’re using charcoal instead of gas, your cook times may vary. For example, the kale may sauté more quickly on a smaller or hotter grill, or the milk may take longer to heat if your coals aren’t giving off as much heat. Like campfire cooking, it’s always best to keep an eye on your food until you have a more comfortable sense of average cook times on your particular grill. Grab a beverage and pull up a patio chair while you give your skillet mac and cheese a periodic check-in. The payoff of eating warm, gooey mac and cheese straight from the skillet without heating up your kitchen? Worth it every time. 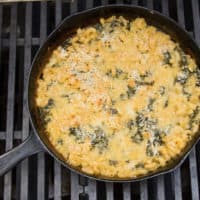 Grilled skillet mac and cheese, made one pot-style in a cast iron skillet, satisfies your comfort food cravings and keeps your kitchen cool. Add fresh kale! Place a 10-inch cast iron skillet on the grill and preheat to medium-low (300-350 degrees F) for a gas grill or indirect cooking for a charcoal grill. Heat the oil in the preheated skillet and add a few handfuls of the kale. Stir to coat with oil, then cover the grill and let the kale cook for a few minutes. As the kale wilts and softens, add another few handfuls, repeating the process until all the kale is cooked through and dark green. Stir in the garlic, red pepper flakes, and a pinch of salt, and cook for 1 minute more. Add the broth and stir to scrape up any browned bits on the bottom of the skillet. Stir in the milk, black pepper, and 1/4 teaspoon additional kosher salt. Cover and let the milk come to a simmer. Stir in the elbows. Cover and cook, lifting the grill lid to stir frequently, until the pasta is al dente and has absorbed most of the liquid. Stir in the cheese a few handfuls at a time, letting the cheese melt into the sauce before adding the next handful. Sprinkle the panko and Parmesan across the mac and cheese. Cover and cook until the panko is toasty and the mac and cheese is bubbling around the edges.